The 103rd Pennsylvania Farm Show will run from Saturday, January 5 – Saturday, January 12, 2019 at the Pennsylvania Farm Show Complex and Expo Center in Harrisburg. As the largest indoor agricultural exposition in the country, the Farm Show welcomes more than half a million visitors each year, along with 6,000 animals, hundreds of exhibits and vendors, dozens of demonstrations and contests, and one incredible butter sculpture! With 24 acres of agricultural entertainment, where does one begin? The Farm Show boasts eight full days of shows, competitions, demonstrations, and exhibits. If you’re having trouble deciding what to see and do, here are a few crowd favorites! At Sheep-to-Shawl, the crowd can watch piles of sheep’s wool get spun and weaved by a team of artisans into beautiful competition shawls. Similarly, Angora rabbits are the fluffiest around, and rabbit breeders weave angora fibers from the bunny to the loom at Angora Palooza. 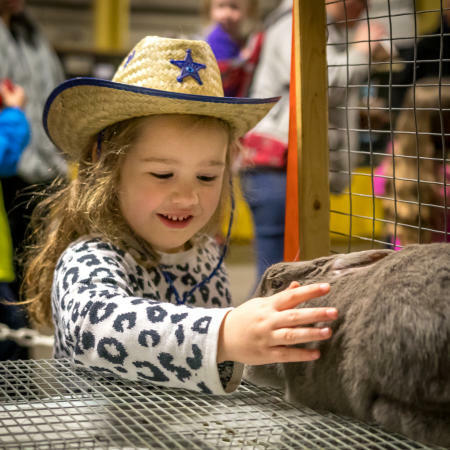 If you like rabbits, don’t miss the Celebrity Rabbit Hopping competition where kids with show bunnies are paired with local personalities as the cotton-tailed competitors hop along an obstacle course. The PA Preferred Culinary Connection stage features cooking challenges and samples. Cooks representing the U.S. Army and the U.S. Navy go head to head in a “Chopped”-style contest to prep best meal from a box of miscellaneous ingredients. Another sweet treat is the Ice Cream Scooper Competition to see who can pile the most ice cream on a cone before time runs out! 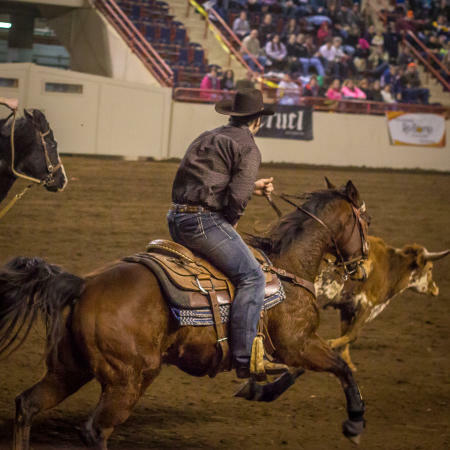 See the ‘Greatest Show on Dirt,’ the First Frontier Rodeo, Jan. 10-12. You’ll need to purchase tickets in advance, but the excitement is worth the purchase! New this year, witness breathtaking freestyle bullfighting Thursday and Friday! You’re going to get your steps in walking around the Farm Show. Make the trek even more enjoyable as you and the family become Pennsylvania Farm Show AgExplorers! Follow the map to roughly 20 interactive stations throughout the complex to learn about all things PA Agriculture, like maple syrup production, mushrooms, veterinary medicine, PA wildlife, forestry with the step-on PA Woodmobile, and more! Say ‘Happy Birthday’ to one of the baby calves born each day of the show at the Calving Corner. Farmer&apos;s Market: Check out the roadside stand-style market in the Main Hall with cheese, maple, honey, vegetables, and apples - all fresh, Pennsylvania products - ready to purchase in bulk. Farm Safety Display: Visit the interactive Farm Safety exhibit in the Expo Hall. Milking a Cow: Ever wanted to try your hand at milking a cow? You&apos;ll have a chance on Friday, Jan. 11 in the Equine Arena! It’s very important that you arrive hungry. With a weeklong celebration of agriculture and farming, you know the food is going to be fresh and delicious, which is why The Food Court is so popular! 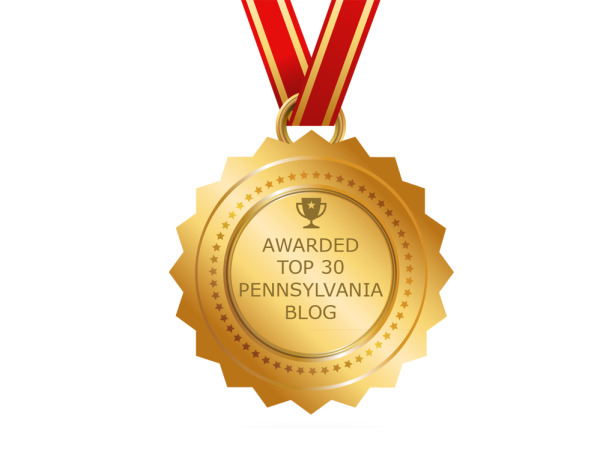 New Year’s resolutions don’t count in Pennsylvania until after the Farm Show is over. Despite the January weather, these legen-DAIRY milkshakes are a must. 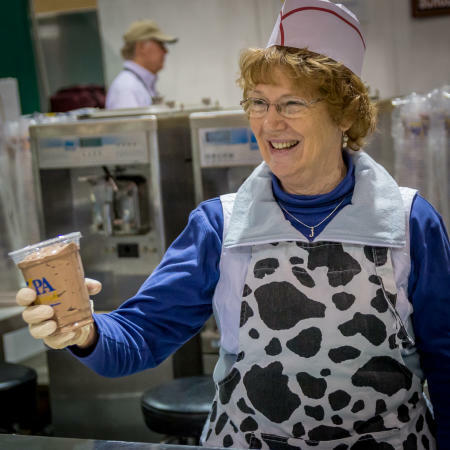 Last year, the PA Dairymen’s Association churned out 23,000 shakes a day. With demand like that, they’ve got to be good! Get several days worth of calcium with toasted cheese sandwiches and deep-fried mozzarella. If you thought you knew all the ways to eat a potato, sample the potato doughnuts by PA Cooperative Potato Growers, Inc., made hot and fresh before your eyes. When you’re in the mood for a fresh crunch, the PA Vegetable Growers Association offers everything from salads and wraps to batter-dipped veggies and blooming onions. Embrace the homegrown taste of Pennsylvania Dutch cooking. Goulash and meatloaf to chicken pot pie and pepper cabbage, traditional Pennsylvanian meals are good for the soul. It goes without saying that you’ll find a seemingly endless array of savory sandwiches, from pork barbecue and beef brisket, turkey burgers and sausages. How about a walking goat taco or a lolly porkchop. You&apos;ll just have to see for yourself! Not to mention the pizza, soups, pies, funnel cakes, apple cider, wine, maple-flavored cotton candy, honey ice cream, and so much more! The Farm Show is a lot of what you’d expect—farm animals, tractors, and competitions—and some things you don’t see every day, like a sculpture made entirely of butter. The American Dairy Association North East keeps its carving design a secret until its revealed, but we can tell you that it will be chiseled with roughly 1,000 pounds of golden goodness. In case you’re worried that so much good butter will go to waste, they use expired butter that would have otherwise been discarded! You probably expected to see lots of animals, but how about animals in costume? 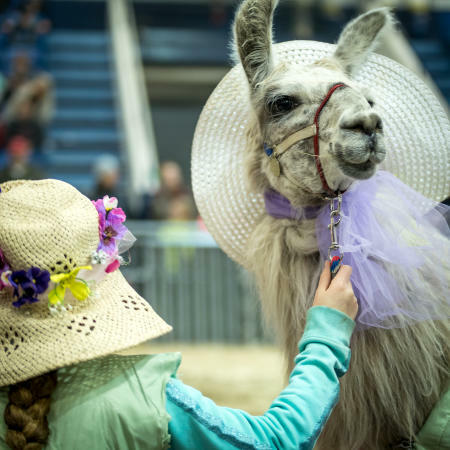 Alpacas are quite agreeable when it comes to clothing and happily don dresses, boas, wigs, hats, jerseys, and other creative apparel for a one-of-a-kind farm fashion show and costume contest. While you can imagine that square dancing has a home at the Farm Show, it’s a unique sight to behold when the arena floor is filled with hundreds of dancers spinning and twirling their teams toward a blue ribbon. If you think their performance takes coordination, wait until you see the tractors. What? Yes, tractor square dancing is the quirkiest Farm Show attraction and a big crowd pleaser to witness eight tractors circling and promenading with expert precision. Admission: It&apos;s FREE to visit the farm show. Best Times to Visit: The ideal time to visit the Farm Show is between 9 AM and noon. The busiest times are weekends and weekdays from 3:30 PM to 5:30 PM. Getting Here: Before you reach the Hershey Harrisburg Region, download the PA 511 app for the latest travel alerts and traffic maps. 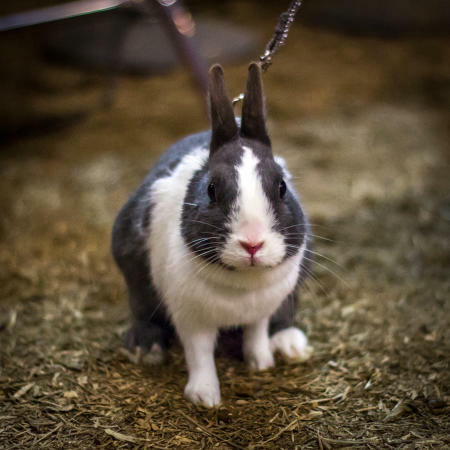 There’s a Farm Show function that can help you avoid snafus in and around Harrisburg. Parking: It costs $15 per car at all Farm Show Complex lots. At peak times the main parking lot can fill up. Stay tuned to the Farm Show’s Facebook page for lot updates. You can also unload everyone at the main entrance of the Cameron Street Lobby, then park the car in the lot. Getting Around: There’s a lot of walking at the Farm Show, and for those visitors with mobility issues, the Farm Show Complex & Expo Center provides wheelchairs free of charge, first come, first served. Pets: For the safety of all animals on the property, no pets are allowed except service dogs. No dogs are permitted in the poultry area. Hygiene: If you&apos;ve had a chance to pet one of our beautiful animals, be sure to wash your hands thoroughly before eating or touching food items. Hand sanitizer stations are available throughout the complex. Safety: Be careful around the animals. If you get too close or startle them, they may kick, bite, or move quickly. Get even more answers to frequently asked questions, plus tips, maps, and more! Follow the Pennsylvania Farm Show on Facebook, Twitter, or Instagram to hear more about the show&apos;s happenings, a full schedule of events, promotions, and more! You can also follow this year’s hashtag, #PAFS19 or post your own Farm Show memories! The Hershey Harrisburg Region boasts fun all year long, and we hope you come baaaaaaaaa-ck again!